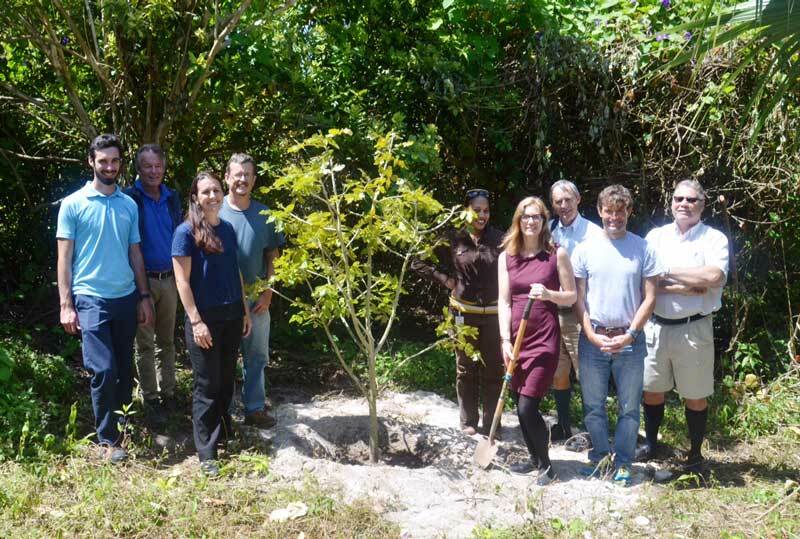 To celebrate Earth Day and kick off its Occupational Health, Safety & Environment Week, BELCO has sponsored the planting of two rare, native Yellowwood trees on the Audubon Society’s Alfred Blackburn Smith Nature Reserve in Paget. Jessica McClure, Manager of Occupational Health, Safety & Environment at BELCO said, “We wish to support the propagation and survival of these threatened, native trees in Bermuda as part of our commitment to the island’s unique environment. Jessica McClure [third from left] and Jan Locke [with spade] of BELCO with members of the Occupational, Health, Safety and Environment team. Also shown are Audubon President Andrew Dobson [third from right], tree propagator Robin Marirea [fourth from left] and Kevin Horsfield [second from left], whose team planted the trees. The Yellowwood [Zanthoxylum flavum] is a broad-leaf native tree that can grow up to 30 feet at maturity. It was much prized in early settlement times as a valuable hardwood and the lumber was exported to England until such export was banned in 1632. It is now very rare and protected by law. Yellowwoods are difficult to propagate and saplings often die, but once established they are very hardy trees, though slow growers. President of Bermuda Audubon, Andrew Dobson said, “We are pleased and grateful that BELCO has chosen to assist us in planting more Yellowwoods on our ABS Reserve. The ABS Reserve, just west of Coral Beach, is a coastal nature reserve open to Audubon Society members and members of Coral Beach Club. Membership of the Audubon Society is open to anyone for just $20 a year.